The prospect of moving to a new home and/or a new city can certainly be exciting, especially if you're upgrading to a nicer house in the process. But a big move can definitely burden you with some major stress. And most of that comes from the difficulties associated with packing up all of your worldly possessions and getting them safely to their destination. Of course, there are plenty of ways to make packing easier when you have a big move ahead of you. Here are some tips to ensure smooth sailing when you pack your belongings into a moving truck and head out for parts unknown. The place to start is with reducing the volume of your stuff. In other words, you need to declutter before you start packing. The reason for this is so that you have fewer items to pack - and unpack later on. You might think it's easier to simply throw everything into boxes and sort it out later. But once you've made your move, you'll find yourself busy with painting and decorating your new space. And the end result is likely to be several boxes that remain unpacked, gathering dust in your garage for the foreseeable future. So take a page from the 'Clean Sweep' playbook, haul the entire contents of each room out onto the lawn, and sort your stuff into piles to keep, donate, and trash. As a bonus, you can pack everything you're keeping then and there. 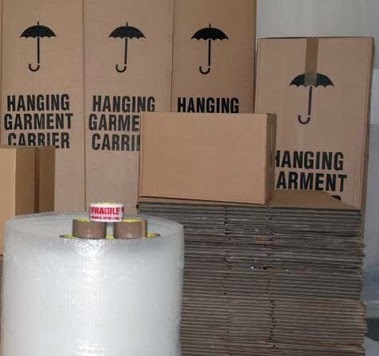 Of course, you can't really start packing until you have packing supplies, so it's probably a good idea to go room by room and make a guesstimate about what you're going to need for your move. Chances are you'll want to start with a variety of boxes. Although you may assume it's easier to simply purchase one size of box, consider the difference between a large box full of plush toys and the same size box filled with books or dishes. Now you know why you need smaller boxes, as well. You might also need bubble wrap and packing tape, as well as a dolly, straps, and moving blankets, all of which can be purchased, or in some cases rented. Once you've sorted out what's going with you and you have the supplies you'll need, it's time to get organized for your move. And there are a couple of ways to go about this. First, you might want to sit down with your calendar and create a schedule. Pencil in dates to pack each room so that you don't get overwhelmed or find yourself frantically packing at the last minute. And while you're packing, you should make detailed lists and label boxes so that you can easily make sure nothing is missing and find all of the items you're looking for when you reach your new home. There are apps like Moving Checklist Pro and Sortly that can help you here. And of course, you should consider hiring a reputable moving company like DB Moves to help you out. If you're lucky, you have some burly friends that owe you a favor. But if not, there's no reason to go it alone. A big move can be made a lot less stressful when you have someone else do the packing and moving for you.